The question “what is the best soccer gift?” comes up relatively often. The most suggested items are usually some small trinkets or ball-shaped gadgets, but here at Champions League Shirts we focus on the most meaningful aspects of soccer culture – the things that truly matter to a real fan. This sport is often more than just a hobby and one needs to understand how a fan thinks in order to pick the perfect gift. Let us then list the top 10 picks that we suggest based on the true soccer culture. A team jersey is the most prized possession of any soccer fan. Wearing the shirt of one’s favorite team is a source of pride and amplifies the connection with the club. A jersey makes therefore a great gift for the soccer lover in your life, especially if they don’t have one yet or if the one they have has become outdated. Choosing a jersey is relatively easy. No matter what the team, they can be ordered online and arrive pretty quickly straight to your door. They come in the standard sizes of small, medium, large, etc, and for an added bonus can be personalized with the number and the name of one’s favorite player, or simply with the name of the person receiving the jersey. An official shirt of a professional team from the current season will cost around 90 dollars (75 euro). Anything cheaper is either an old shirt from the previous season or a knockoff replica of inferior quality that will have differences from the original. Here you can find the current home and away jerseys of the most popular clubs by selecting your team here. The team scarf is the second most important possession of a true fan. Scarves are worn around the body to games and events and are often hung in prominent spots in rooms and over mantelpieces. They are highly decorative and have a special place in the hearts of soccer lovers. They are raised in the air during chants at the stadiums or simply waved in living rooms when the team scores. They have been a big part of the soccer culture for decades. There are many scarves for each professional club. However, they are all quite decorative and display the right amount of team colours, names and any potential slogans. You really cannot go wrong here, no matter which one you pick, as long as it’s the right team. You can even find mini-scarves and silk versions for added fun, but the standard size, knitted scarf is always a safe bet. A scarf will cost you around 10 to 20 dollars (8-17 euro). You can see the scarves of today’s top clubs here. If the soccer lover in your life already has a shirt of his or her club, they will now be looking for every day items or even collectibles of their favorite team. There is something immensely satisfying about having a mug, a bag, a blanket or even a clock with your team’s logo on it. Incidentally, this provides us with a number of quite unique gift ideas. Finding what you want in this category is quite easy once you know where to look. Your only homework is to find out what the favorite team of the recipient is. Once you know that, you can go to the official website of the team in question, click on their online store and select. Alternatively, sites like Subside Sports or Kitbag offer excellent, good quality selections of team merchandise and collectibles from the world’s best clubs. Both deliver quickly and securely and have good return policies, so shopping there is safe and worry free. The shipping is cheap and can even be free on select size orders, depending on the season. Follow this link to check out their selection. A step up from the above is autographed memorabilia. This is the domain of the more serious fans, those who live and die with their clubs or have a strong interest in the history of soccer. Here, we are talking about signed photographs of players, posters, books, game balls, cleats, or even autographed jerseys. These items quickly become prized possessions, given their autographed status. This category is more pricey, as it reflects the real value of items in question. Additionally, signed items come in limited quantities, which both increases their value over time and guarantees uniqueness. The price range in this category is from 100 to 500 dollars (85-420 euro). The items are shipped straight to your door in specially padded containers. Once they are gone however, they will never appear again. You can check the currently available autographed memorabilia right here. The greatest prize in the world – the World Cup trophy – is is 36.5 centimeters (14.4 inches) tall, weights 5 kg (11 lb) and is made of 18 carat (75%) gold. It looks absolutely beautiful and every real fan has dreamed of holding it above his head for even a moment. It is awarded only once every four years and is the final prize of one of the greatest shows in sports – the World Cup tournament. Replicas of this iconic trophy are available and can be found in various sizes. The closer they get to the original size the more impressive they look and quickly become the centerpiece of a room. They are of course not made of real gold (or they would cost a fortune) but can look absolutely real in their imitation. We recommend this particular replica, as it is beautifully crafted and resembles the original faithfully. Alternatively, here is a bigger version. This one is more expensive, but it’s stylized exactly after the World Cup 2018 Russia trophy and comes on a decorative pedestal. 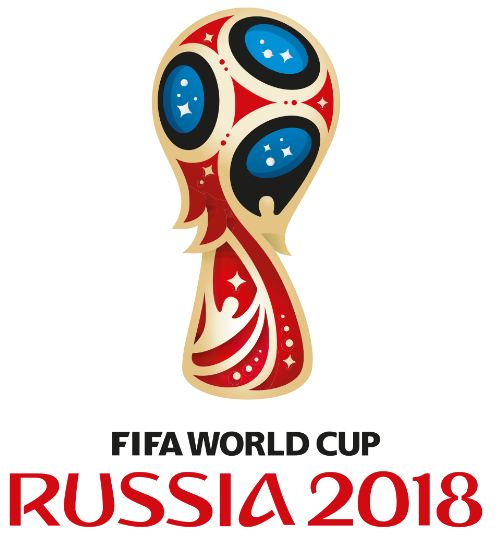 The World Cup is the biggest event in football, rivaled only by the Olympics in popularity. It happens every four years and it can throw the world into a frenzy. Every self-respecting soccer fan – no matter how passionate – lives and breathes this event and can’t wait for it to start. Simply put, it’s the biggest show in the world. It doesn’t get any better. 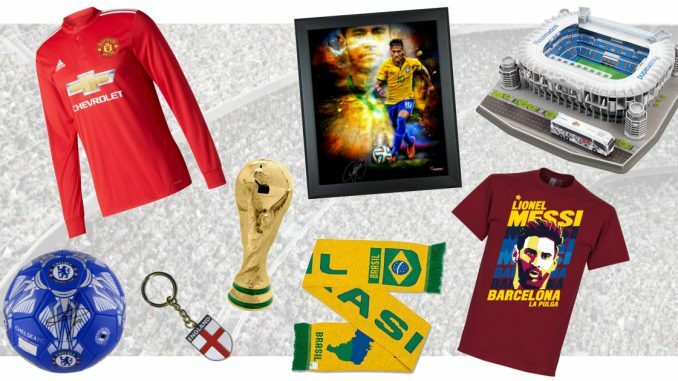 Consequently, any World Cup related gear, apparel or collectibles make good gifts. One simply has to know where to look – as there are many companies that make cheap quality merchandise – but we have taken care of this for you with the link just below. Prices will vary, depending on what you pick… from small, fun trinkets like key chains, pins and cup holders, which will run you just a few dollars or euro, to shirts, or even collectible posters or signed prints that can run well over a hundred bucks. There is choice and variety in this category. 3D puzzles are immensely popular and make excellent gifts. The newest additions to the 3D world are the stadiums of the world’s most famous clubs. From the iconic Wembley Stadium to Real Madrid’s Santiago Bernabeu or even Barcelona’s Camp Nou the 3D stadiums look impressively real when completed and often come with trains or team buses that can be parked right in front of them. Nanostad – the company that makes them – is even licensed to display the real logos of the clubs themselves, adding more authenticity to the final effect. These puzzles look very beautiful and very closely resemble their real counterparts, with painstaking details. They are fun to assemble and challenge the mind with their 3D complexity. What’s more, they make beautiful display pieces when completed. They are relatively large (approximately 35 cm. X 30 cm. X 10 cm) and their parts are made from foam board and quality printed paper. They require no glue or tools, come with instructions and are suitable for adults and children from 7 years of age. They cost from 30 to 50 dollars. You can see the current list of 3D puzzle stadiums here. Real soccer shirts are highly collectible. While the design of the primary kit of each professional club changes slightly from season to season, the old shirts are often treated with nostalgia among the fans. Some beautiful designs existed in the past and they are still available today. Wearing a retro jersey is often the sign of awareness of the past struggles and glories of one’s team. They mean more than initially meets the eye as they bring with them history, memories and pride. Selecting a retro shirt is very much like choosing a club jersey. You just need to know the size of the recipient (small, medium, large, etc) and possibly the favorite team. The only difference is that retro shirts are harder to obtain, but we have taken care of some of the selection for you with the link below. A retro jersey should cost from 50 to 80 dollars, while retro jackets and track tops will be about ten bucks more. A great selection of top quality retro gear can be found here. The Re-Take company is famous for a wide range of full quality retro shirts and national tees related to soccer. With a vast selection of subject matters ranging from game day glory to comedy and to famous players, it has been setting a fashion trend for a while. The Retake t-shirts have been immensely popular in many countries already and are taking over soccer fashion like a storm. Retake t-shirts come in wide selections. You can find t-shirts related to one’s club, one’s national team, legendary players, moments in history (like league or cup wins) or humor. They even have an equally impressive line of hoodies with similar topics. More importantly, Retake products come in a wide range of price points, so there is something for any budget. A Retake t-shirt will cost you anywhere between 10 and 45 dollars (16-38 euro), while a hoodie will run in the vicinity of 40 dollars. Check out the new lineup of current Retake gear. Each World Cup has an officially designed ball. The design changes from tournament to tournament (every four years) and quickly becomes iconic. True soccer fans can quickly identify official balls from the previous World Cups at a glance, as each brings memories. Kicking a World Cup ball is the closest any of us will ever get to playing in the greatest tournament on Earth, although in many cases these gems become just display pieces and do wonderfully as such. 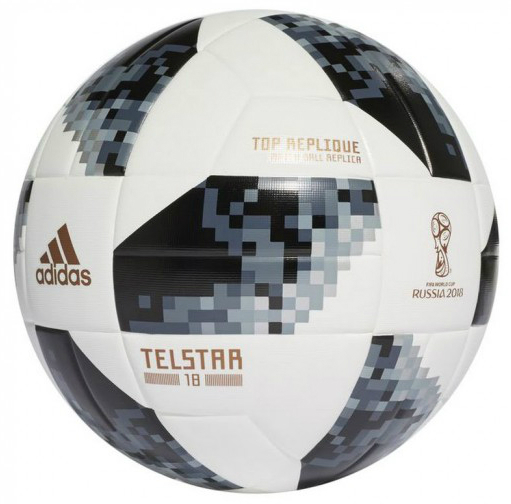 The present world cup ball is made by Adidas and is named Telstar 18. It is a re-imagined concept from the 1970 FIFA World Cup, when legends like Pelé, Gerd Müller, Giacinto Facchetti, Pedro Rocha and Bobby Moore graced the field. The name “Telstar” comes from its status as “Star of Television”. It is made of 100% synthetic leather, comes in one size and has the official World Cup stamp on it. You can get it delivered to your door here. If nothing from the above list works for you, we recommend a straight look at the soccer section on Amazon. Believe it or not, Amazon – being the largest online retailer in the world – has a massive selection of gifts in this genre. There, you will find not only the items from our above categories, but a variety of other unique ideas. Once you find an idea you like, you can even narrow the search and quite likely run into even more choices. The only danger is that Amazon is really quite large and it’s easy to get lost there, so if your mind has a tendency to wonder, remind yourself to stay on target. Those unfamiliar with Amazon yet will find that the store is very much like any other online retailer. They deliver to your home address, have return policies on most items (just check the product description) and even keep a list of reviews from previous customers and their experiences. They sell items from all over the world and from a large variety of retailers, so their selection tends to be huge. To find what you want, use their search feature or proceed straight to this category . Got any other ideas for the best soccer gift? Do you have any review requests or comments? Let us know below! Beautiful blog layout. My son started playing soccer about two years ago briefly. He really liked it. You’ve inspired me to get him back in. Love the merchandise. Thanks. Best of luck to your son! I loved the pictures. They look really nice. I am not into sports myself, but I knowfew people that love soccer. I will definitely share this with them. Thank you so much for the beautiful work. Thanks for writing this. I was looking for some good retro team shirts for my son. He really likes wearing them when he hangs out with his friends. Do you happen to know a price range for the retro shirts, though? I’m on a tight budget but want to get him one shortly. Retro shirts usually cost between 50 to 80 dollars (42-67 EUR). Some select ones can be more, depending on the shirt itself, but that’s usually the price range you can expect. If you are on the budget, you can check Amazon, where from time to time you can get a deal on a retro shirt. Such deals are rare however, as the retro shirt market is popular. An alternative to retro shirts are the Retake jerseys. They are not official replicas of the past seasons, but there you can find commemorative shirts that portray a specific achievement in a club’s history or that celebrate a legendary player. I love how you get to the root of every fans desire. I really like how everything is laid out and cant wait to see more helpful posts! Great post. I was born in the UK but live in Australia. Great to know about these items. Arsenal fan so I will definitely look through the jersey’s and shirts. Yes the world cup is not far away so I think your post will do really well. We have the Commonwealth Games starting here in April so massive year for sport. We’ll be featuring Arsenal soon, including the history of their colours and kit, so I hope you enjoy! Thanks for the comment. I actually like the team gear and collectibles. I’m all about collecting things, so this is why these stood out 🙂 However, because I’m a big fan of the soccer world cup championships, I mostly like the WORLD CUP TROPHY REPLICA! I really do need one of these in my life! I checked out your links and saw a price decent price tag especially for what you get. Thanks a lot!